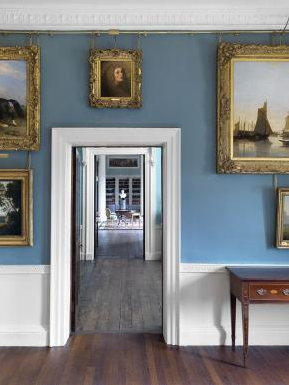 Kenwood House, one of the great small collections, has finally been restored. What a delightful revelation. My perfect Sunday morning. Get up, brush teeth, go out and buy The Sunday Times. Have two poached eggs on toast, with tea. Walk across Hampstead Heath saying “Good morning” to nervous people who aren’t used to being spoken to by strangers. Go into Kenwood House and look at the Rembrandt. Then the Vermeer. Then the Frans Hals. Then the Van Dycks. Then the Turner. Then, finally, at Gainsborough’s portrait of Helen Mirren, whom I always recognise, even though she was calling herself Countess Howe at the time, which was around 1764. Bliss. Unfortunately, reader, for the past 18 months, this perfect Sunday morning has not been available to me because, cruelly, Kenwood House has been closed to the public for a floorboard to roof-tile restoration costing £5.95m. Frankly, they may just as well have closed down Sundays. Month after month, weekend after weekend, I would trudge droopily across the Heath like a beaten spaniel, hoping for an end to it. Now there is one. London, of course, has other small collections that offer the same kind of intimate art experience as Kenwood. The Dulwich Picture Gallery. The Soane Museum. The Hunterian. God created weekends specifically to enable us to visit these marvellous places: no arguments there. But, somehow, when it comes to Sunday mornings, Kenwood House is in its own perfect slot. One great Rembrandt. One great Vermeer. Two great Van Dycks. And one great Gainsborough. I’m no Euclid, but are these not the ratios of the golden section? Something about the number of superb art moments available at Kenwood, divided by the number of pictures in the collection, achieves a perfect visitatorial equilibrium. And that’s just the art. If you have visited Kenwood before, you’ll know already that the pictures are the climax of the experience, but that there is also the foreplay of the gardens. Designed by Humphry Repton at the end of the 18th century, the grounds of Kenwood are wilfully meandering. Repton, a notoriously cunning landscape gardener, was famous for his carefully achieved “surprises”. That’s why, on one side of the lake at Kenwood, he positioned a bridge that looks real, but isn’t: it’s just a wooden outline. And why he sends you stomping twistily through a dark forest (which, incidentally, is home to London’s largest population of pipistrelle bats) before ejecting you onto a particularly vivid green hillside, at the top of which sits a gleaming white architectural shoe box: Kenwood House itself, designed by Robert Adam in the 1770s. Kenwood was built for the Earl of Mansfield, Britain’s Lord Chief Justice, “the celebrity judge of his day”, as a country house that didn’t necessitate going to the country. Mansfield was a noted progressive in much of his thinking — his best-known legal judgment made slavery illegal in England and Wales in 1772 — and in his aesthetic tastes he was also futuristic. Not only was Adam the Zaha Hadid of his day — a fierce lover of white, with a taste for sparseness — he was also Scottish, as was Mansfield. The pretend country house they jointly transported to north London is as white as it is, white as morning milk, because Adam was a determined neoclassicist. In 1754, he left Scotland for Rome, and when he returned, five years later, his head and his heart were filled with angelic classical paleness. The neoclassicists (what a terrifying name that is) believed that the art of the ancient Greeks and Romans was white, precise and ordered, and that the art of their own times should aspire to these same levels of purity. We now know that the pure-white fantasies of the neoclassicists were, in fact, thoroughly misleading. Classical sculpture and architecture was originally highly coloured: but paint wears off, while stone does not. Not knowing this, the neoclassicists, alas, set about producing an architecture that was often scarily sparse — you will like white, you will! But, as the newly restored Kenwood so agreeably proves, Adam had a poetic streak in him as well. And while the outside of Kenwood glares at you as whitely as Joey Essex’s teeth, the inside is a pitch-perfect succession of pale blue and pink interiors. Just how graceful they are has been made entirely evident by the recent restoration. In the 18 months of closure, all the paint schemes of Kenwood were the subject of an unusually thorough re-examination. For the library alone, they microscopically examined more than 400 paint samples before establishing the exact order of Adam’s original hues. 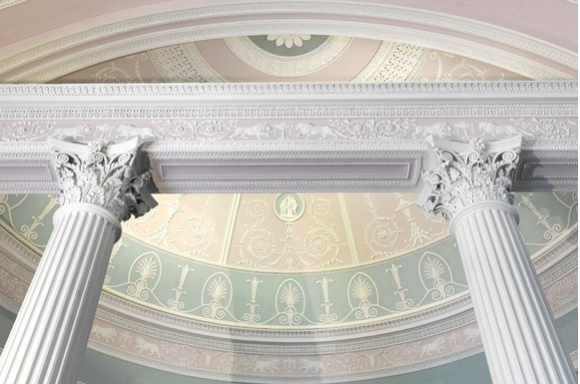 They have also got rid of the cumbersome bits of gallery furniture dotted about the building — the desks, the ropes, the colour-coded carpets — in a huge spring clean that has left behind an especially crisp and sherbety neoclassical experience. You know when you go to the dentist, and he sends you to the hygienist, and the hygienist scratches and polishes all the blurring off your teeth and leaves them feeling perfectly defined again? Well, that’s what the new Kenwood feels like. The entrance hall is the first revelation. The walls and doors are now an enchanting Adam blue; the damp old carpet has been replaced by a dry new one; and although I, personally, could have done without ye olde fire burning in ye Adam fireplace, the note of domestic relaxation they are striving to hit here feels right. Adam’s interiors were intended for a country house, not a museum, and the effort to return them to that mood is an honest one. The finest room here, the famous Kenwood library, has been completely transformed. The Ionic columns in the vestibule leading to it used to look like yellow-green marble. I had always assumed they were meant to be that way. But no. The paint samples reveal they were originally Carrara white, and that is what they are again. The changes in the library itself are shocking. In the old days, the floor was lined with a fierce red carpet; and a set of daunting museum ropes stopped you straying from a short, central vantage path. The carpet has gone. So have the imprisoning ropes. These days you can wander wherever you want across a splendid expanse of Georgian floorboards, admiring yourself as you pass in the exquisite Chippendale mirrors built into the niches. The biggest change is overhead, where the heavy gold decoration that used to compartmentalise the roof has been replaced by a new colour scheme of pale pink and blue. A room that previously felt like something one Russian oligarch might give to another now feels like a delicate bit of Wedgwood. But you will be wondering about the paintings. Well, they’ve all got new picture lighting and are all easier to see. The great Rembrandt self-portrait, his finest, is as puzzling as ever, with those mysterious circles drawn on the wall behind the painter’s back. Vermeer’s Guitar Player remains whispery and nervously enchanting. Frans Hals’s happy chappy still has a big grin on his face. And my secret pleasure, Gainsborough’s Helen Mirren, is still pretending to be Countess Howe, and still wearing the most gorgeous pink dress in the whole of the English rococo.